Be Food Smart is a new Change4Life campaign launched this week, by Public Health England (PHE). According to PHE, Children consume half the daily recommended sugar intake before the morning school bell rings. I’m delighted to see this new campaign so early in the New Year. I did my bit via a prerecord for BBC 5 Live yesterday. As I have said before, sugar is the biggest threat we have to good oral healthcare. But there are also many other preventable diseases where a reduction in sugar input would help. Apparently, children in England consume more than 11g of sugar at breakfast time alone. this equates to almost 3 sugar cubes. The recommended daily maximum is no more than 5 cubes of sugar for 4- to 6-year-olds and no more than 6 cubes for 7- to 10-year-olds per day. By the end of the day, children consume more than three times these recommendations. As a parent myself, I know it can be difficult, often because the sugar content is not labelled in a way that is easily understood. Also some products, like Muesli, are heavily marketed at children and parents as ‘healthy’ when they are not. Always be aware of the range of names to describe sugar – like dextrose and fructose. Want to Be Food Smart? Help is at hand! 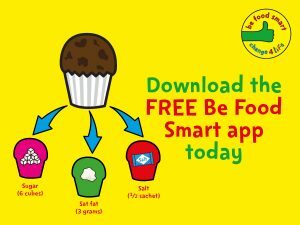 But the Be Food Smart campaign comes with a Smartphone App to help us out. Once downloaded, simply scan the barcode of products in your store cupboards. The app will tell you the sugar, salt and saturated fat content. Then it uses a simple traffic light system to show you how healthy the product is. The government has promised that it will tax producers of highly sugary drinks in 2017, and that’s a great start. But food manufacturers must also behave responsibly by clearly labeling the sugar content in food, and reformulate their products so they contain less sugar. The high sugar content of many breakfast products and everyday foods has an adverse effect on us. Food manufacturers need to put less sugar in their foods by reformulation. They should also be incentivised into doing so by the threat of a further sugar tax. We’ve seen the threat of a sugar tax on soft drinks is beginning to have an effect as companies are being to reformulate their products to contain less sugar.